The Christmas season was one of Bishop Ken Carter's favorite times to preach when he was a church pastor in North Carolina. He has a three-inch binder stuffed with sermon ideas,quotes and poems that he has collected over the years in honor of the season. Some of the papers there contain original thoughts that were later published; others reflect the thoughts of other religious leaders or mainstream artists. Carter sees Christmas as the beginning of the New Year, full of opportunities to make new disciples. "The most effective churches see Christmas Eve as a way to meet new people and talk about what they will do during the next year," he said. It also is a good time to dedicate an offering to a mission that targets the congregation's local community, he added. Today we begin a series of reflections from the bishop to celebrate the season. 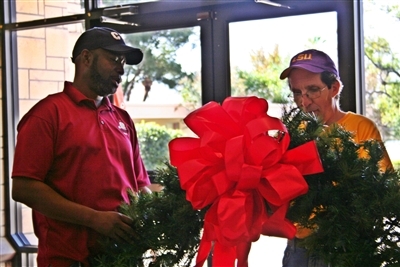 Volunteers Jay Saulter, left, and Joe Dionosi prepare to hang the steeple wreath at First UMC, Lakeland, in preparation for Advent season. Photo by Susan Green.